The Pittsburgh Penguins have agreed to terms with Gary Agnew to join the coaching staff as an assistant coach, it was announced today by head coach Mike Johnston. Agnew, 54, was an assistant coach for the St. Louis Blues under Ken Hitchcock the past two seasons. During that time, the Blues won the fifth-most games (81) and allowed the fourth-fewest goals in the NHL. A native of Niagara Falls, Ontario, Agnew was a Columbus Blue Jackets assistant coach for four seasons from 2006-10, helping the Blue Jackets make the organization’s first-ever playoff appearance in ’08-09. He also served a brief stint as interim head coach for Columbus. “I am very excited to add Gary Agnew to our coaching staff,” Johnston said. “He is a long-time NHL assistant who has worked with both forwards and defensemen, along with having extensive special team's experience. 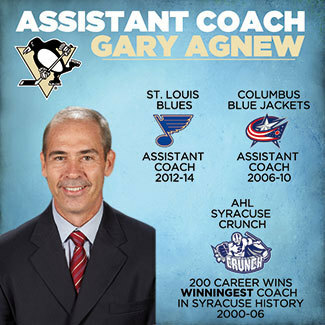 Prior to joining the Blue Jackets, Agnew was head coach of Columbus’ American Hockey League (AHL) affiliate in Syracuse for six years. During his tenure in Syracuse, Agnew established a franchise record by winning 200 games, as well as the team’s first division title in ’01-02. Agnew has 11-plus years of head coaching experience in the Ontario Hockey League (OHL), most recently with the Oshawa Generals in 2011-12. He has twice served as the bench boss in London (1997-2000; 1990-94) and was head coach of the Kingston Frontenacs for three seasons (1994-97). During his OHL coaching career, Agnew produced an overall record of 352-296-53-11 (.539 pct. ), winning OHL Coach of the Year honors in 1992-93 and ’97-98 with London. He led Kingston to its only division title in franchise history in ’94-95. Agnew played four seasons of college hockey at the University of New Brunswick before playing professionally in the International and American Hockey Leagues for two years. Following his playing days, Agnew began his coaching career as an assistant coach, first at the University of New Brunswick for two seasons beginning in 1985, and then for three years with London, before the Knights promoted him to head coach in 1990. Agnew and his wife, Barbara, have a son, Brett, and a daughter, Lindsay. Brett played college hockey at Ohio University and Lindsay plays college soccer at Ohio State.